For 2011, the WOSM organized a logo contest to choose the official logo. More than 100 logos were submitted. The winner of the contest is: Felipe Trejo Malpica from the Octavio group in Jalisco, Mexico. "The reef knot unites the world so it doesn't rip apart, especially in these times of crisis," Felipe said. "It also symbolizes the Scout Brotherhood throughout the world. In the typography of JOTA, the letter O represents radio communication; in JOTI, the letter I, a mouse represents the Internet. This idea is to graphically represent a world which uses modern means of communication to send a message of peace, unity, and of support in the face of the disasters that surround us." Each year, more than 500,000 Scouts in more than 100 countries take to the airwaves on the third full weekend in October -- and this year will be no different. 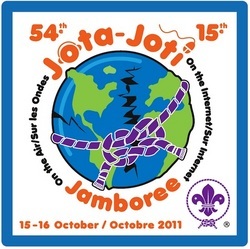 The Jamboree On The Air (JOTA) is a Scouting and Amateur Radio event sponsored by the World Scout Bureau of the World Organization of the Scout Movement. JOTA is an annual event where Boy Scouts, Girl Scouts and Girl Guides from all over the world speak to each other via Amateur Radio. Since 1958 -- when the first Jamboree on the Air was held -- millions of Scouts have met through this event. Many contacts made during JOTA have resulted in pen pals and links between Scout troops that have lasted many years. The radio stations are operated by radio amateurs, and many Scouts and leaders hold licenses and have their own stations. The majority of JOTA Scouts participate through stations operated by local radio clubs and individual hams. Read more here. On September 12, at the invitation of White House Cybersecurity Coordinator Howard A. Schmidt, W7HAS, the ARRL briefed several members of the National Security Staff on the capabilities of the Amateur Radio Service to communicate in emergencies. "The White House is looking for ways that the great work of Amateur Radio operators can continue to support emergencies in the future with particular attention to increased use and dependency on Internet-based technologies," Schmidt said. The ARRL presentation, conducted by Emergency Preparedness Manager Mike Corey, W5MPC -- along with President Kay Craigie, N3KN, and Chief Executive Officer David Sumner, K1ZZ -- focused on Amateur Radio's current and evolving capabilities to provide Internet messaging connectivity. 435 MHz - 145 MHz Linear Transponder: The linear transponder will operate in Mode U/V (70 cm up, 2 meters down). It is a 16 kHz wide inverting passband from 435.742 to 435.758 MHz and the convention will be to transmit LSB on the 435 MHz uplink and receive USB on the 145 MHz downlink between 145.922 and 145.938 MHz. AMSAT Secretary Alan Biddle, WA4SCA, said the ARISSat-1 Team is looking for entries in the Chicken Little Contest. This is your opportunity to calculate or guess when ARISSat-1 falls out of orbit. This is defined as the time it crosses an altitude of 78 kilometers, which is considered to be the point of no return. "This involves your prognostications, calculations, guesses, darts-in-the-calendar submissions for when ARRISSat-1 makes its final orbit," Biddle said. "We have a fair number of submissions from all over the world from adults, but very few from students. If you know of one who might be interested, encourage them to enter." Read more here. What are you building for the Third ARRL Homebrew Challenge? The ARRL has sponsored two Homebrew Challenges in the past, designed to test our members' design and construction skills by making useful amateur gear at low cost -- and sharing their results with our members. Our first ARRL Homebrew Challenge, announced in QST for August 2006, required the construction of a 40 meter, 5 W voice and CW transceiver built for less than $50 of new parts. 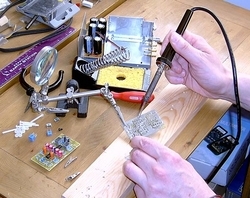 The Second Homebrew Challenge, announced in February 2009, resulted in a number of creative designs of low cost 50 W linear amplifiers to follow the transceiver -- two for about $30, as well as a multiband amplifier with many features for somewhat more. The deadline for the Third Homebrew Challenge is Tuesday, November 1. Read more here. Reviewing and recommending programs designed to represent the organization to the public, enhance the organization's image, and communicate with the media. Nominations should include a summary of the nominee's actions that qualify the individual (or individuals) for this award, plus verifying statements from at least two people having first-hand knowledge of the events warranting the nomination. These statements may be from an official of a group (for example, the American Red Cross, The Salvation Army, a local or state emergency management official) that benefited from the nominee's particular Amateur Radio contribution. Nominations should include the names and addresses of all references. Read more here. The Sun, as seen on Thursday, September 29, 2011 from NASA's SOHO Extreme Ultraviolet Imaging Telescope. This MDI (Michelson Doppler Imager) image was taken in the continuum near the Ni I 6768 Angstrom line. The most prominent features are the sunspots. This is very much how the Sun looks in the visible range of the spectrum. Tad "The Sun shines forever" Cook, K7RA, reports: Our Sun has been very active this past week, with the average solar flux rising nearly 12 points to 155.5, while the average daily sunspot numbers dropped nearly 41 points to 96.1. This implies fewer, but more intense, sunspots. A huge sunspot group numbered 1302 emerged on September 22. This was the source of a coronal mass ejection that triggered an immense geomagnetic storm. The planetary A index peaked at 67 on September 26, followed by 30 the next day and 24 on September 28. The planetary K index reached 8 for two of the three-hour reporting periods on September 26, indicating an intense geomagnetic storm. The resulting aurora was observed in many places, including Maine, Massachusetts, Michigan, Minnesota, New York, North Dakota and South Dakota. On September 22, there was a major X1.4 class solar flare at 1100 UTC, with a large CME, but this was when sunspot 1302 was just coming over the horizon, so it wasn't Earth-directed. On September 24, sunspot group 1302 produced a larger X1.9 flare. 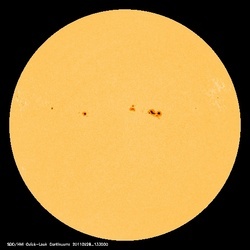 Currently, the latest forecast from NOAA/USAF has solar flux for September 29-October 7 at 130, 130, 125, 120, 120, 115, 110, 110 and 140, and then 145 on October 8-10 and 140 on October 11-17. The predicted planetary A index is 12, 5 and 8 on September 29 through October 1, then 5 on October 2-7, then 8, 15, 12 and 8 on October 8-11 and 5 on October 12-21. Look for more information on the ARRL website on Friday, September 30. For more information concerning radio propagation, visit the ARRL Technical Information Service Propagation page. This week's "Tad Cookism" is brought to you by Bananarama's Through a Child's Eyes. Each month in QST, the ARRL devotes a page to print letters from its members. This is a chance for you to express your opinions -- good or bad -- on ham radio-related matters. Your opinion counts! Send your letters electronically to qst@arrl.org or via postal mail to Correspondence, 225 Main St, Newington, CT 06111. You can also fax your letters to 860-594-0259. We read every letter received, but we can only publish a few each month. We reserve the right to edit your letter for clarity and to fit the available page space. Letters published in QST may also appear in other ARRL media. The ARRL assumes no responsibility for statements made by correspondents.